In this step you will be required to submit your brief details to generate and print an online challan. Please keep your Registration number safe. If you want to reprint the challan later, you can use this registration number. Proceed for payment after 24 hours of printing the Bank Challan. You can either deposit Cash payment at any of the branches in the given List of Branches. You will be provided an receipt of transaction with a Unique Transaction Number. Open the Bank Website > NEXT. Select State & Type of Organisation (Corporate/Institute/Government Department) > NEXT. Select Organisation/Department Name > NEXT. Select process (Credit/Debit Card/Net Banking) you want to choose for Online Bank Payment > Make Payment. Proceed for application after 48 hours of depositing the Bank Challan. 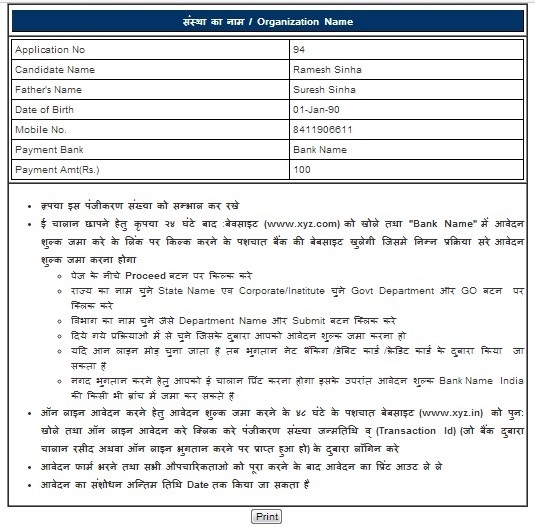 You will require the Registration Number, Unique Transaction Number and Date of Birth to start your online Application. 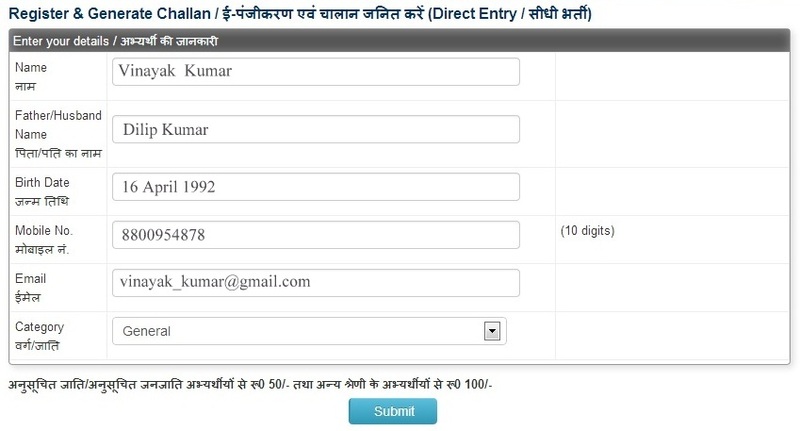 If you get logged off accidentally, you can complete/ edit your application again using this unique combination of Registration Number, Transaction Number and Date of Birth/Mobile No. To add photograph, browse a scanned image in JPG format less than 1MB size, scanned according to the specified dimensions (if any). To add documents, browse a .PDF / .DOC / .DOCX / .JPG document less than 1MB size. After completion of the Online Application form along with all the required information, photos and documents, the applicant can print it to keep a copy safe for his reference. The Date of Launch of Admit cards is almost pre decided and printed on the webpage under the "Important Dates" heading. The candidates can visit the website time to time near the predecided Launch date for Admit cards. After the launch of admit cards, the notice is floated on the website and in some cases the candidaes are also informed by automatic SMS to all eligible candidates. The applicants can download their Admit cards by entering their application number. Read more about Printing Admit cards.